Photo by Brent Szklaruk//The Vanderbilt Hustler. Most of the students at Vanderbilt had just entered their awkward, pre-teen phase. In the entertainment realm, the Grammy for Song of the Year went to Lady Antebellum for “Need You Now”, while The Oprah Winfrey show came to an end after twenty five prolific seasons.That May, Osama Bin Laden was tracked down and killed by Navy SEALs. We also witnessed SEC product Tim Tebow make an unexpected, yet epic playoff run with the Broncos, followed by the emergence of the “Tebowing” craze. You may ask, why is any of this relevant? Well, 2011 also happened to be the last year in which the Vanderbilt Commodores began a season 3-0. They enter week three of the 2017 season with a 2-0 record and the chance to accomplish this feat once again, though it won’t be an easy task. In order to do so, they must beat the Kansas State Wildcats. To cap off a dominant week of SEC football (nine of the eleven non-conference games resulted in a win for the SEC team), we have another set of themed power rankings. It’s only fitting that we give each team their counterpart in the form of a 2011 movie. Did anyone expect the Crimson Tide to lose to Fresno State? As crazy as it may sound, their 41-10 victory seems underwhelming to most. The Bulldogs came into the game as 44 point underdogs and they only lost by 31. Good for them. Once again, Jalen Hurts proved to us that he is lethal in all aspects of the game. This week, he completed 78% of his passes for 128 yards and a touchdown, rushing for 154 yards and two more touchdowns. On offense, their run game is extremely effective, while for other teams, it’s nearly impossible to rush against the Crimson Tide’s tough defense. As a case in point, Fresno State rushed for just 58 yards, and Alabama piled up 305. Harry Potter and the Deathly Hallows: Part Two was as long-awaited by its fans as football season was by Alabama fans. Simply put, it was one of the best films of 2011. Not only was it nominated for three Academy Awards, but it grossed over a billion dollars worldwide, ranking it eighth all-time and number one in 2011. Similarly, Alabama football is the best there is and they generate incredible revenue each game. The only reason why a team like Fresno State would schedule a game against them is for the $2.4 million paycheck they received in exchange for getting pummeled. Led once again by prolific running back Derrius Guice, the LSU Tigers had no trouble demolishing a clearly weaker opponent in Chattanooga. A slow start saw Chattanooga score the first points of the game, but the Tigers quickly bounced back to score 42 straight. However, it is hard to say that the Tigers looked strong or mentally tough during this 42-0 run or in the game in general. They were penalized 11 times, one more than in their opener against BYU. This lack of mental toughness has to be fixed and fixed fast as they enter games against tougher opponents. However, it was not all negative for LSU in this game, or in this season as a whole. With four rushing touchdowns this year thus far, it is hard not to compare Derrius Guice to Lightning McQueen of Cars 2. He finds holes and makes cuts similar to McQueen when he is on the race track. In Cars 2, McQueen finds himself up against a true test in the Grand Prix. And like McQueen, Guice and the Tigers have their first true test of the season against an undefeated Mississippi State team with a very explosive offense. If they can get past their mental errors, as McQueen had to undo the wrongdoings of Mater, it should be smooth sailing for Guice and the Tigers. Despite the unfamiliar trek up North, the Georgia Bulldogs came to play against a very tough Notre Dame Fighting Irish team. It was the team’s first time traveling to South Bend, and even so, they remained poised. Despite star running back Nick Chubb being limited to 63 yards and no touchdowns, they still were able to get the ball moving on offense, which is always a good sign. In addition, their run defense was stingy, limiting the Notre Dame rushing attack to just 55 yards. It was also a great sign that freshman Jake Fromm stepped up and brought the Bulldogs home with the win. Just as in Pirates of the Caribbean, where Jack Sparrow and his crew travelled to unfamiliar, unchartered lands and came away victorious, the Bulldogs came away victorious on the road against a tough opponent in the Fighting Irish. But the victory came off a clutch go-ahead field goal with 3:34 left in the 4th quarter from Kicker Rodrigo Blankenship, (*Spoiler Alert* ) much like how Sparrow saved Angelica by giving her the remains of the water from the fountain of youth. Now with a week to regroup against a weak Samford squad, the Bulldogs have a lot to look forward to and prepare for after this inspiring and key road win. Going into Death Valley is never an easy task, especially when the Clemson Tiger squad the Auburn Tigers played against is looking as strong as they have been this year, fresh off a national title. Despite this, Auburn played an incredible defensive game, limiting Clemson to a meager 14 points. Typically, limiting a team to 14 points should be enough to get a team a win, but with an offensive performance as pitiful as the one Auburn put up, it is hard to beat anyone. This offensive showing started and ended with the offensive line, a line that was completely overwhelmed with Clemson’s size and strength up front, with no answer for defensive end Austin Bryant, who recorded four sacks. When an offensive line doesn’t click at all, it is nearly impossible to win a football game. It was hard for Auburn to get anything going on the ground, and even harder for QB Jarrett Stidham to get any room to throw the ball. After being completely annihilated, the offense, and particularly the offensive line, have to go off the grid like Ethan Hunt in Mission Impossible: Ghost Protocol and reconsider their game plan in order to stay at the top of their game. If their offensive line doesn’t get in check however, the rest of their season will truly be a “Mission Impossible”. South Carolina began the season ranked 9th in our power rankings, but after scoring over thirty points in both of their first two wins of the season, they have crept up to 5th. The kick returning unit has been nothing short of exceptional thus far, averaging 43.5 yards on its six returns, two of which were taken to the house. Other than that, the Gamecocks find themselves in the middle of the pack in nearly every statistic in the SEC. We can’t seem to find the answer to their success; like Billy Beane in Moneyball, someone’s been doing their homework. In each of the Gamecocks’ first two games, they’ve been outgained on the offensive end–they gained 246 yards to North Carolina State’s 504, and this week they gained 359 yards to Missouri’s 423. Some of this yardage has been lost to their kick return unit, as they start their offensive possessions with significantly less field to cover. Offensive coordinator Kurt Roper could be the key to their success. He’s maintained a remarkably varied offensive approach by opting to run the ball 61 times while passing the ball 57 times. In addition, Roper has sent out his offense in some bizarre sets that few teams are prepared to cover. One of these looks includes lining up with three tight ends. As a defensive coordinator, it’s nearly impossible to gameplan for this unforeseen formation, especially when Roper has used it to create large gaps for his run game, and even to pull off the rare tight end sweep for a touchdown. South Carolina’s lack of dominance in any major offensive category refuted with their impeccable efficiency tells us that someone has been doing the math. Moneyball, perhaps the best sports movie released in 2011, helps us relive the true story from the book in which the 2002 Oakland Athletics remarkably built a flawless team. This story is so incredible because Billy Beane, the general manager at the time, did so by paying only a fraction of salary other teams paid. This was because he used sabermetrics: a way of measuring player efficiency by analyzing baseball statistics that may have once seemed foolish. Someone on the South Carolina coaching staff is pulling a Billy Beane, because no one saw this coming. After their first two games, The Mississippi State Bulldogs look tough to beat. Everything seems to be clicking on offense, scoring 49 and 57 points, respectively, in their first two outings. With that being said, this upcoming week will be their first true test as they face a strong Louisiana State Tigers squad. Another strong performance by quarterback Nick Fitzgerald, who 225 total yards and 5 TDs last game, will be needed as they play their first SEC opponent and their first ranked opponent all at once. Not only is their offense needed in this next game and beyond, but their defense and special teams will need to be at the top of their games as well. Two total touchdowns for these units seems great on paper, but their defense gave up a ton of yards to a weak Louisiana Tech team. If not for perhaps the most bizarre play in sports history — one that resulted in a 3rd and goal where Louisiana Tech was a whopping 93 yards from the end zone after both teams forgot how to pick up the football and essentially kicked it backwards — this game could have been much closer than it was. They can’t expect a break like this against LSU. Just like in Final Destination 5 where the survivors of the crash feel safe, precautions must be taken as LSU is a much stronger opponent than the teams they have faced thus far. Coming out of week 1, the Arkansas Razorbacks looked strong, completely demolishing a clearly weak opponent in Florida A&M. Then came their first real test against 23rd ranked TCU, where they came out bleak and had no answer for the Horned Frogs’ strong defensive unit. Much like how Mr. Popper was completely overwhelmed by his penguins after his life seemed to be clicking on all cylinders, the Razorbacks’ offense was caught off guard by TCU. They were limited to just 7 points, and quarterback Austin Allen completed a pitiful 9 passes on 23 attempts. In order to get around this and get back to their week one form, the Razorbacks need to learn how to perform even against top defenses. Luckily for them, they have a week off to regroup. Just like Mr. Popper learned how to cope with and learn from his penguin debacle, the Razorbacks need to take this week off and learn from facing a tough defense before their next game against a fellow SEC West opponent in Texas A&M. There is nothing worse for the Florida Gators than coming off a rough week without key offensive wide receiver Antonio Callaway only to have their next, easily winnable, game against Northern Colorado cancelled due to Hurricane Irma. They lost their chance to prove themselves after a rough opening week outing. Now instead of going into an important week three matchup against in-conference opponent Tennessee sitting at 1-1, they stay fresh off a loss with no offensive rhythm at all. Another week of headaches is in store for the Gators as they have had no real game exposure to test out their new offensive and defensive schemes that they most definitely drew up after their rough outing against Michigan. This is why Hangover II is the obvious choice for their movie comparison. Florida’s stressing is similar to that after a night out with little to no recollection of the prior events. Essentially, the Gators are starting fresh and trying to fix the mistakes they made against the Wolverines, but instead of playing an easy opponent, they are going against a ranked Tennessee team. Now, they have to endure another full week of stress, as starting a season 0-2 will send them down an awful path going forward, especially with a tough schedule ahead. 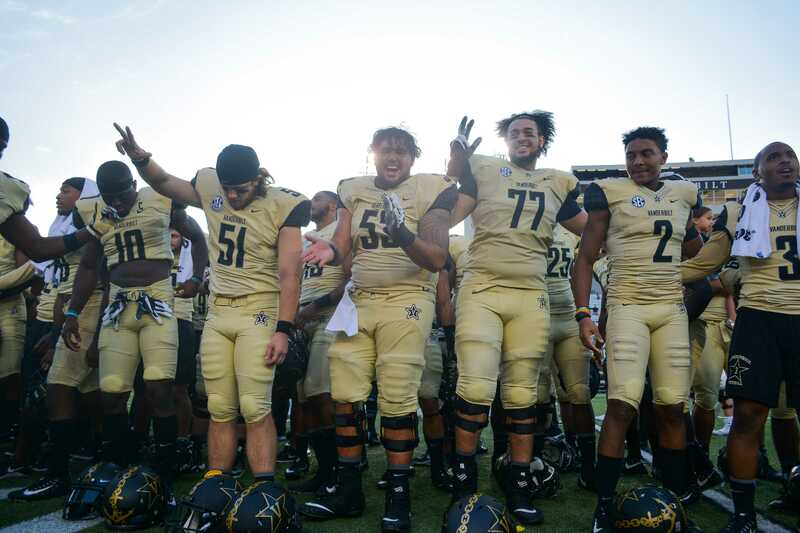 The upcoming game is one of epic proportions for the Commodores. They are currently unranked and received a mere two points in this week’s College Football Rankings (via The Associated Press Poll), while the Wildcats’ 475 points are good enough to rank them 18th in the nation. However, we have three important words for our readers: never say never. This documentary tracked Justin Bieber’s road to success, a path that seemed just as challenging — and to many, just as unlikely — as Vanderbilt’s road to the top 25. With that being said, people are starting to take notice of the Commodores’ hot start. Quarterback Kyle Shurmur led the offense with four passing touchdowns and one rushing touchdown en route to scoring 42 points. Shurmur also broke a 56-year old Vanderbilt record by completing 83.3% of his passes before the entire first-team offense was prematurely taken out and given rest. The defense was also stout, posting its first shutout since 2012 and entering this week ranked first in the nation in both red zone defense and third down percentage. Never say never, folks. Expect the Commodores to “fight till forever”. For some reason, even after a week one scare against unranked Georgia Tech, the Tennessee Volunteers stayed in the top 25. Then going into week two, they blew past a weak Indiana State team, and in a way, validated their ranking. However, we still aren’t buying their success. For one, they honestly should have lost to Georgia Tech, who completely botched a field goal attempt at the end of the game and then took a huge risk in going for two in overtime when they could have easily tied the game with an extra point. Despite this, it isn’t all negatives for the Volunteers. Their run game seems strong with running back John Kelly leading their team in both rushing and receiving in week two. Their special teams shined once again as they ran back a kick for a touchdown on the opening play. This upcoming week they face their toughest challenge as they play a struggling, yet still ranked and strong, Florida Gators team. A win this week would catapult them up the rankings and negate their start to the season. However, we expect the Gators to come out strong after a week off in a must win game for them and play the Adjustment Bureau by taking Tennessee down and taking their ranking with. Tennessee has been historically dominated in this matchups, losing 11 out of their last 12 games with the Gators. Sure, A&M won this week, but they still moved down three spots in our power rankings. Week one was rough for the Aggies. In the process of blowing a 34 point lead and losing to UCLA, they lost two starters to injury: quarterback Nick Starkel and defensive back Donovan Wilson. In fairness, their ten point win over Nicholls is enough to land them a fitting comparison to Fast Five. Fast Five was debatably the best Fast and Furious movie in the series, just as Texas A&M is debatably the best of the worst teams in the SEC. Filling in for Starkel, backups Jake Hubenak and Kellen Mond haven’t quite cut it, with Quarterback Ratings of 43.2 and 29.2. Their passing game wasn’t a threat against Nicholls, with the two quarterbacks throwing for a combined 198 yards and one touchdown. They were forced to rely heavily on running backs Kendall Bussey, Trayveon Williams, and Keith Ford. Surely this approach won’t work against other SEC powerhouses, especially if their defense is so stingy that they let up fourteen points to Nicholls. The Fast and Furious franchise has made a whopping eight movies and many would argue they should have quit while they’re ahead. The same can be said about Texas A&M; although they couldn’t quit, they should’ve been contempt after their preseason ranking of sixth. With two strong performances from quarterback Shea Patterson, including last week’s school yardage record-breaking performance, the Ole Miss Rebels’ offense has looked strong. Other than that, it is hard to say many positive things about this Ole Miss squad who trailed UT-Martin by a score of 16-7 in the 2nd quarter. Their run defense looks terrible, giving up a whopping 233 yards on the ground. Ole Miss will have to rely on Patterson and the rest of the offense a lot if they want to overcome the amount of time and points their poor front 7 will allow going forward. While Ole Miss can “Sleep Tight” for now, playing FCS opponents while in the SEC won’t last forever. Just like how Cesar came for his tenants, strong SEC opponents are coming for Ole Miss and their security blanket will slowly be taken off by ensuing demolitions from Alabama and Auburn. And even if they can fend off these opponents, which they won’t be able to, it doesn’t really matter due to the looming allegations and postseason ban that the Rebels face. Kentucky is 2-0, and no, it’s not basketball season. They’ve opened the season with wins against two mediocre, out of conference teams in Southern Mississippi and Eastern Kentucky, but it doesn’t seem like this winning streak will last much longer. In the next two weeks they face South Carolina and Florida, respectively. If they’re still undefeated after those games, then it’s time to take them more seriously. Other than their record, there isn’t much that differentiates Kentucky from the other SEC teams. They won both games in a similar fashion, with final scores of 24-17 and 27-16. They haven’t established any true strengths, as they’re in the latter half of the conference in nearly every statistic: they’re 10th in total offense and 8th in total defense, neither of which is something to brag about. While quarterback Stephen Johnson has been playing mistake-free football and has yet to throw an interception, he hasn’t done anything to turn heads either. Kentucky has the pleasure of being compared to Thor, one of the better movies released in 2011. Their 2-0 record is comparable to the success of Thor, but Thor is a movie about the god of Asgard who is sent to earth as punishment for being arrogant. He bears a giant hammer called a Mjölnir and with it he has the power to control thunder. That plot is about as realistic as Kentucky staying undefeated until even the halfway mark of the season. The red-hot Missouri offense couldn’t carry the weight of the entire team this week. They only scored 13 points en route to a home loss to the South Carolina Gamecocks. If they’re 1-1 and through two games rank first in the SEC in total offense, second in passing offense, and third in scoring offense, why do we rank them last in the conference? The easy answer is that their defense cannot seem to get the job done. Like almost all team sports, football is a multidimensional game. You can’t expect to win with a great offense and the worst scoring defense in the SEC. Mizzou’s defense has more holes than swiss cheese, allowing an average of 37 points per game. They had a solid first quarter in which they did not allow a single point, but their weakness was exploited in the following three, as South Carolina managed to score 31 points. In this movie, Adam Sandler attempted to play the role of both main characters, Jack and Jill. The horrid result shows just how hard it is to succeed in a multifaceted field when you can only be held responsible for one.